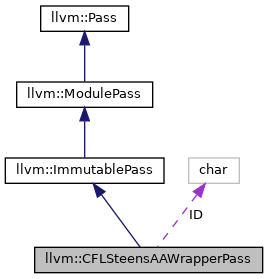 Legacy wrapper pass to provide the CFLSteensAAResult object. Definition at line 122 of file CFLSteensAliasAnalysis.h. Definition at line 345 of file CFLSteensAliasAnalysis.cpp. Definition at line 354 of file CFLSteensAliasAnalysis.cpp. Definition at line 130 of file CFLSteensAliasAnalysis.h. Definition at line 131 of file CFLSteensAliasAnalysis.h. 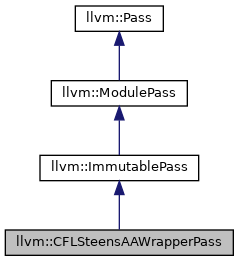 initializePass - This method may be overriden by immutable passes to allow them to perform various initialization actions they require. This is primarily because an ImmutablePass can "require" another ImmutablePass, and if it does, the overloaded version of initializePass may get access to these passes with getAnalysis<>. Definition at line 349 of file CFLSteensAliasAnalysis.cpp. Definition at line 126 of file CFLSteensAliasAnalysis.h.